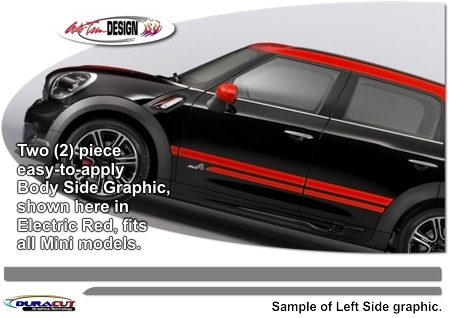 Set your '01-Current Mini Cooper apart from the rest with this unique Countryman stylized Body Side Graphic kit. Available in a wide variety of colors, graphic is precut and packaged with one (1) left and one (1) right side graphic. Slight trimming required at each wheel well and door jamb area. While shown on a Mini Cooper Countryman, graphic is universally size to fit all models of Mini such as the Cooper, Clubman and Paceman. Graphic shown on Countryman is placed approximately 5.75" (14.61cm) from bottom edge of door (dryfitting suggested on each vehicle for proper placement).